Talking with your children about important topics can be hard. Whether it's "stranger danger," bullying, or the birds and the bees, it's hard to know when to bring things up and what to say. Money can be one of those difficult subjects. Some families have a "don't ask, don't tell" policy about finances, while others share every detail from bills to bank accounts. No matter where you fall on that spectrum, you and your family should talk about the value of money and the importance of saving it. When's the right time to start discussing money with your kids? The sooner, the better. While you don't expect your toddler to start saving money for college, suggesting that she put some pennies away towards a toy she wants is a good first step. And, as your children get older, you can discuss how they should regularly save some of their allowance (if they receive one). A 2012 study of 2,000 parents by DoughMain, a free financial education site for families, revealed that 63% of kids under 18 have a savings account, and 73% of those with an account started one at three years of age or younger. Making a special trip to the bank to open a savings account can be the perfect time for a family money talk, and your kids will enjoy seeing their deposits start to add up. But, you need to keep taking them back after you open the account. The DoughMain study showed that just 42% of kids add money to their account monthly, while 38% only add it on birthdays and holidays. As children get older and receive larger allowances, or later when they get part-time jobs, you can encourage them to save toward big-ticket items, like electronics, expensive outfits, or even a car. 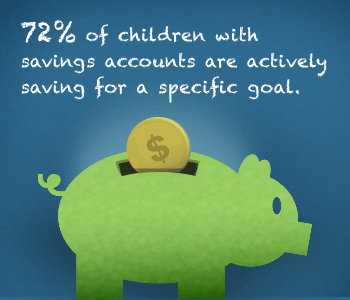 The DoughMain study showed that 72% of children with savings are actively saving for a specific goal, such as video games, toys, and, more importantly, college. Teaching your kids to delay gratification by passing up smaller items now so that they can get bigger things in the future is an important lesson that'll help them throughout their lives. The lesson will be more meaningful if you show rather than just tell. If kids see you giving up something now to save for a future reward they may be more likely to follow your advice. These early chats can lay the groundwork for more serious money talks, like the ones you'll have about paying for college. Even if you've opened a 529 account, you may still want your kids to contribute towards college. Whether their savings go towards textbooks or maybe a computer, your kids will appreciate those things more because they paid for them. And, as they get closer to college age, you may want to talk with them about how loans work and what it means to carry debt—and how saving now can help them (and you) owe less later. As with other difficult subjects, the more money talks you have, the more likely it is that your kids will come to you with their questions and concerns. If you're looking for fun ways to teach your kids about money, there are some online programs for you to consider. Spending regular time with your kids focusing on financial literacy will help them develop the good habits they'll need to become financially savvy and secure adults. *A plan of regular investing does not ensure a profit or protect against a loss. Note: When you use this feature, you'll leave nysaves.org and go to a third‑party website. Neither the NY 529 Direct Plan, the State of New York, Ascensus Broker Dealer Services, Inc., nor Vanguard or any of their respective affiliates takes responsibility for content on third‑party sites or the services provided. Please be aware that when you use services provided by a third‑party site you're subject to that site's terms of service and privacy rules, which you should review carefully. Ready to pay that tuition bill? Avoid these 529 plan mistakes. How much do you need for college? Saving for college outside of a 529 plan? You may be missing out on benefits. What's inside your 529 stock portfolios? Two big questions about college: What will it really cost, and how much should you save? Save for college now. Borrow less later. It is that simple. Are you taking extra risk with your 529 savings? What if your beneficiary skips college? What’s inside your 529 stock portfolios? What’s the best way to save for college? Educational debt: How much is too much? The information contained herein is general in nature, is provided for informational purposes only, and should not be construed as legal or tax advice. Investment returns are not guaranteed, and you could lose money by investing in a 529 plan.